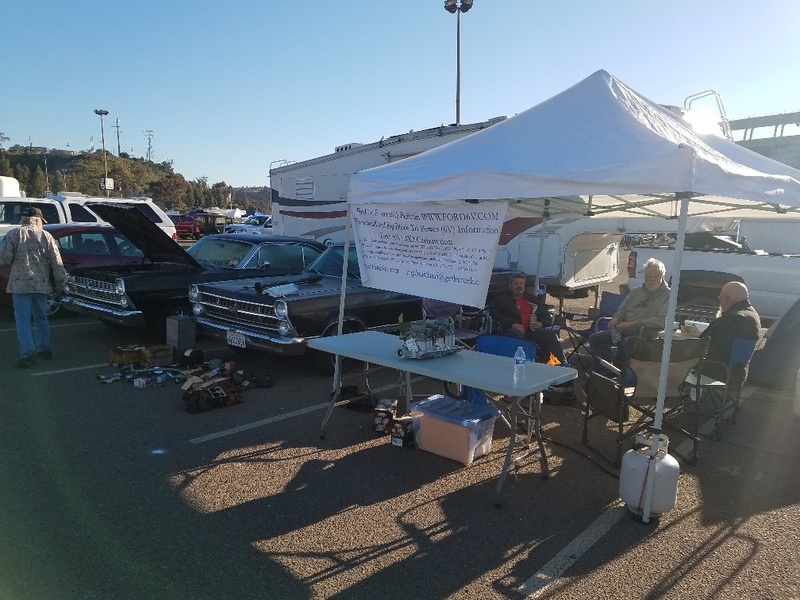 This event was first held in the spring of 1966 when just a few club members got together in the parking lot at the College Grove Shopping Center. The next year it grew to about 200 vendors and was held at the Sears parking lot in Hillcrest. 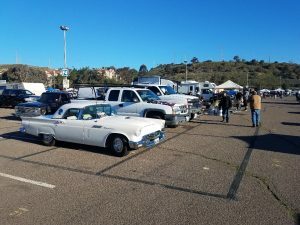 The event continued there for another year and then moved to the parking lot behind the old Sands Hotel in Kearny Mesa. 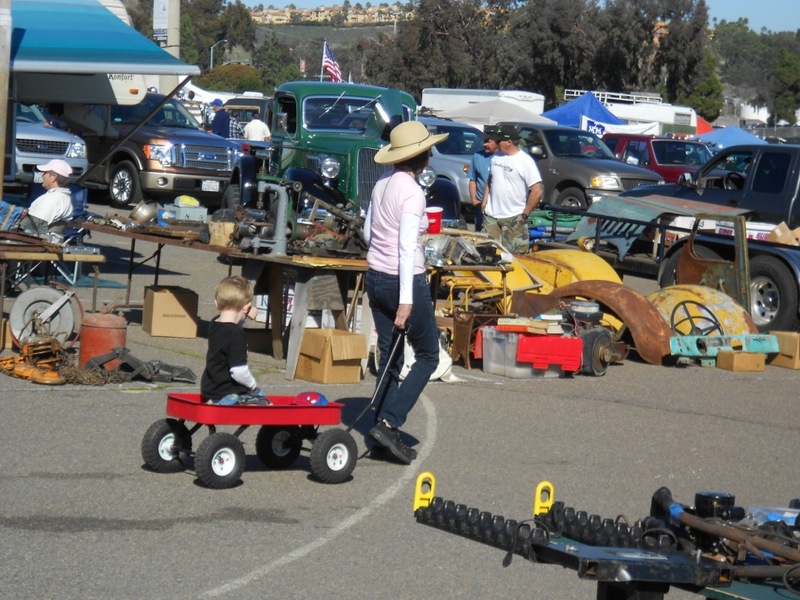 The City of San Diego then decided to ban swap meets, so arrangements were made to move the event to the Sears lot in El Cajon. 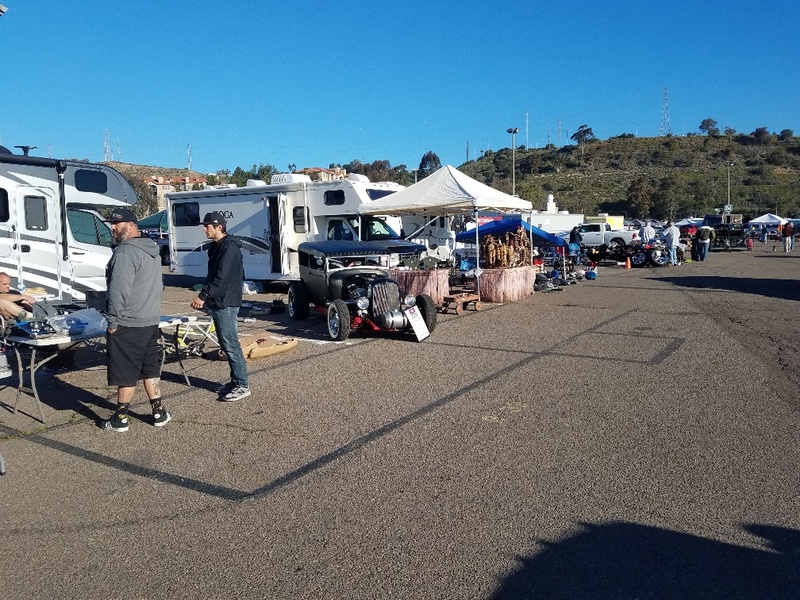 As the event continued to grow, this site could no longer accommodate the huge number of participants so the event was moved to El Cajon Speedway parking lot. 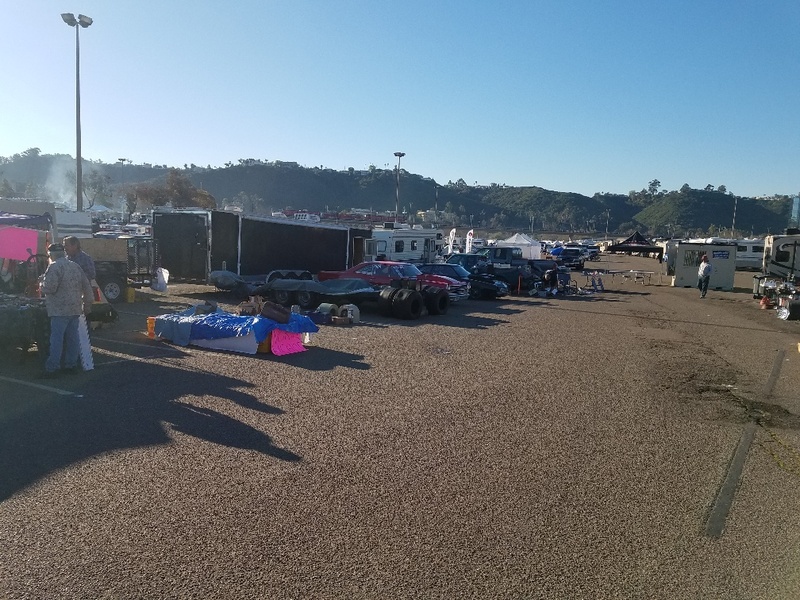 This site accommodated the growth of the event, but as the parking area was all dirt and the winter rains constantly turned the annual automotive event into a mud bowl, a new site had to be found. 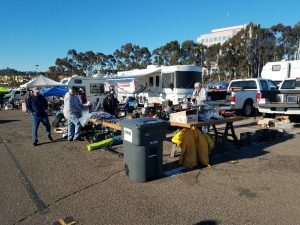 With a change in policy by the City of San Diego allowing swap meets, arrangements were made to move the event to SDCCU Stadium, formerly Jack Murphy (Qualcomm) Stadium in 1980. There the “BIG 3” Parts Exchange has become an annual fixture for individuals who appreciate those fantastic vehicles of the Past. There is no charge to the general public to attend this event, however, there is a stadium parking fee. The shoppers hours are 12 noon to 4PM Friday, 8AM to 4PM Saturday and 8AM to 12PM Sunday. THE ANTIQUE AUTOMOBILE CLUB OF AMERICA The Antique Automobile Club of America is an international organization with members in all 50 states and in more than 50 countries of the world. The AACA is incorporated under the provisions of the Nonprofit Corporation Code of The Commonwealth of Pennsylvania. There are over 400 regions and Chapters with over 50,000 members. The San Diego Region meets the first Monday of each month at 2717 University Avenue in North Park at 7:30 p.m. The membership of the region is over 120 families. The aim of the AACA is the perpetuation of the pioneer days of automobiling by furthering the interest in and preserving of antique automobiles, and the promotion of the sportsmanship and of good fellowship among all AACA members. The AACA used the term “automobile” in a comprehensive sense to include all self-propelled vehicles intended for passenger use (cars, race vehicles, trucks, fire vehicles, motorcycles, powered bicycles, etc). Similarly, the term includes various power sources, such as gasoline, diesel steam and electric. The AACA official publication Antique Automobile is distributed bimonthly to all members. The purpose of the AACA is to provide an organization for members with a mutual interest in the antique automobile hobby. For more information check out the web site www.aaca.org . The Horseless Carriage Club is a non-profit association of people dedicated to the enjoyment, study and restoration of vehicles manufactured prior to 1916. The club was organized in 1937 by a group of enthusiasts in Los Angeles, California who foresaw the need for an organization dedicated to the preservation of automotive history. The Horseless Carriage Club offers membership to collectors, historians and anyone else with an interest in vintage automobiles and their history. You do not need to own a car made before 1916 in order to belong. Many members derive their enjoyment of the hobby by reading about early automobiles in the club’s bimonthly Horseless Carriage Gazette. For more information about the San Diego Regional Group visit the web site at www.horseless.com or write to: HCCA S.D. Regional Group, 2038 Vista Hermosa Way, El Cajon, CA 92019. The Early Ford V8 Club was established in 1963 by a group of individuals interested in the 1932-1953 Early V8 Fords, also known as the “Flathead Years”. Since that time, the Club has grown to more than 9000 members worldwide with over 155 Regional Groups around the world. Ownership of an Early Ford V8 is not a prerequisite of joining the club, only an interest in these fabulous Fords is sufficient. Membership brings the V8 Times, the club’s full color magazine published six times a year. The San Diego Regional Group, chartered in 1969, has a membership of over 145 families and meets the third Wednesday of the month at 7:00 p.m. at the San Diego Automotive Museum in Balboa Park. Visit the web site http://www.sandiegoearlyfordv8club.org/. If you have an interest in the 1932-1953 Fords, Lincolns or Mercurys, then this is the club for you. Visit the web site www.earlyfordv8.org . BIG 3 – BIG NEWS !!!!!! Friday: Feb 22nd, swap meet hours will open to the public from 8:00 AM to 5:00PM. 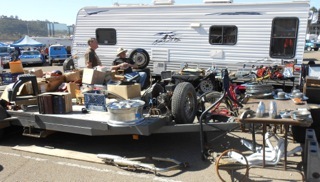 Saturday: Feb 23rd swap meet hours will open to the public from 8:00 AM to 3:00PM. 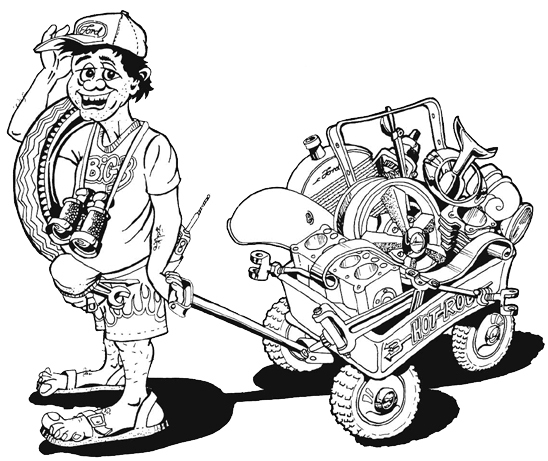 In spite of the date changes, we look forward to a great Big 3 Swap Meet as always, So Don’t forget your wagon!!! For vendor information please go to: www.bigpartsexchange.com or contact todd65@big3partsexchange.com or call or text Todd Harding at 661 374-6754 or find us on Facebook.